​Ukrainian armed forces have allegedly killed more than 25 wounded people in a hospital in Krasny Liman, on the outskirts of Slavyansk, as the National Guard seized the town from the local militia following heavy shelling. “According to preliminary information, more than 25 people have been killed,”Denis Pushilin, Chairman of the Supreme Council of the People's Republic of Donetsk was quoted by Itar-Tass. The number of injured is still unknown as well. During an assault on the town people inside the hospital tried to flee in panic and hide in the basement. Medical staff scrambled to get the wounded, mostly elderly out, as mortar shelling on the medical facility continued. 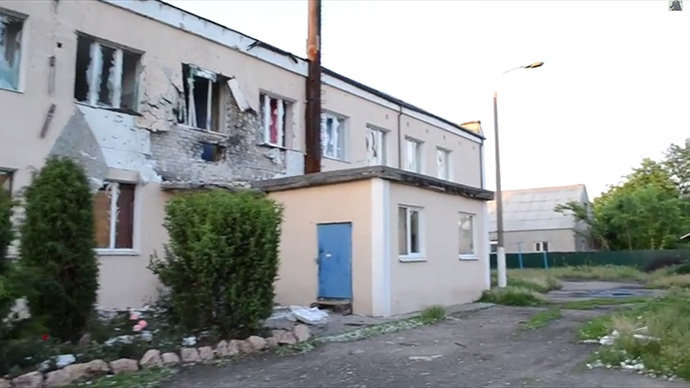 The town of Krasny Liman with some 30,000 residents, located 18km southeast of Slavyansk in the Donetsk region was heavily shelled by the Ukrainian army during Kiev’s military operation Tuesday. The center of town with densely populated residential areas, and the train station also became scenes of the mortar assault. Massive damage to the railway track in Ukrainian air strikes resulted in cancellation of services, the press service of the Donetsk railway authority said on Wednesday. “Railway workers who remained alive are being kept in captivity. 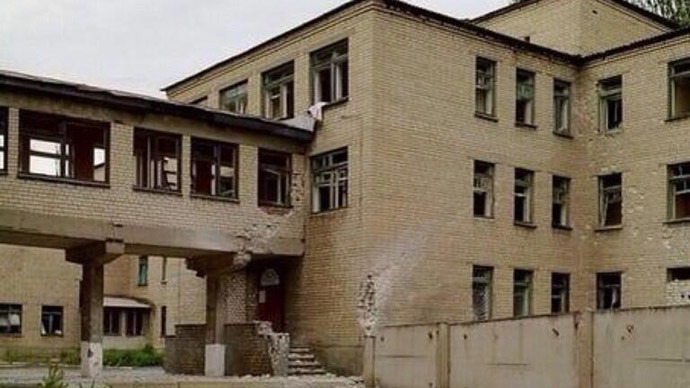 Snipers do not permit them to go out,” a source told Itar-tass, not elaborating on where the people were locked up. “All who lay down their arms and surrender voluntarily are guaranteed life and fair justice,” the leaflet reportedly read, adding that that those who don’t would be killed. Another local resident RT managed to speak with, Nataliya, said that people are terrified. She claims that the Ukrainian security services tapped the phone lines, intimidating people who are petrified to discuss anything with their friends and relatives for the fear of retribution. Most of all people are afraid of point blank murder by the Ukrainian forces of civilians, she said, adding that the city has been completely surrounded by government troops and no one is allowed to leave the besieged town. There are also numerous reports that the Ukrainian National Guard continues to raid apartments in Krasny Liman looking for self-defense forces. 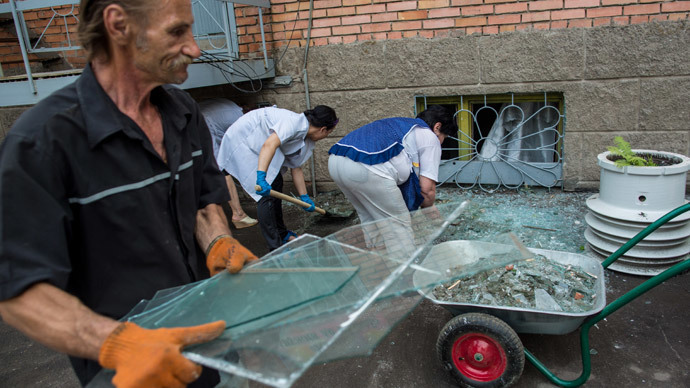 On Tuesday, the National Guard intensified what Kiev calls an ‘anti-terrorits’ operation with a massive artillery attack on Slavyansk, a city with a population of over 110,000 people, and its suburbs at 6am local time. The fighting was “the longest fight that has happened during the entire standoff in Ukraine,” said the press secretary of the People’s Mayor of Slavyansk, Stella Khorosheva. A spokesman for Kiev’s “anti-terrorist operation”, Vladyslav Seleznyov claimed that more than 300 self-defense troops were killed and about 500 wounded in and near the city of Slavyansk, where Kiev forces used aircraft, helicopters and artillery to capture the region. 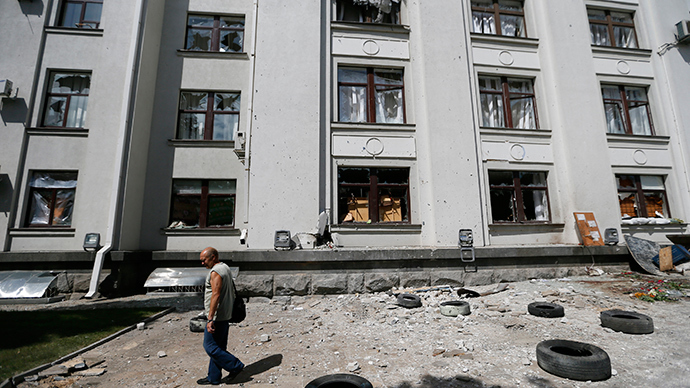 Seleznyov said only 2 Ukrainian troops were killed and 45 wounded. 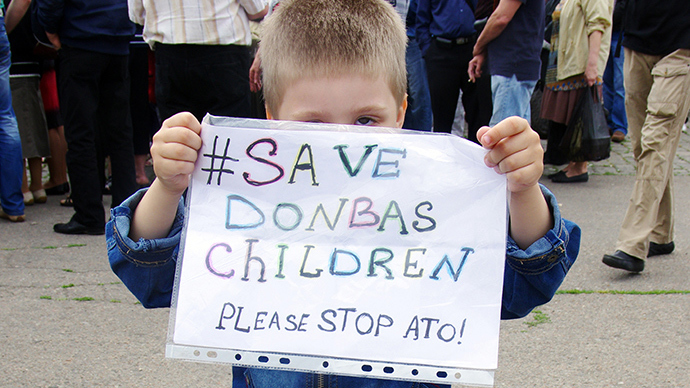 “Krasny LIman was surrounded by government forces on Tuesday. 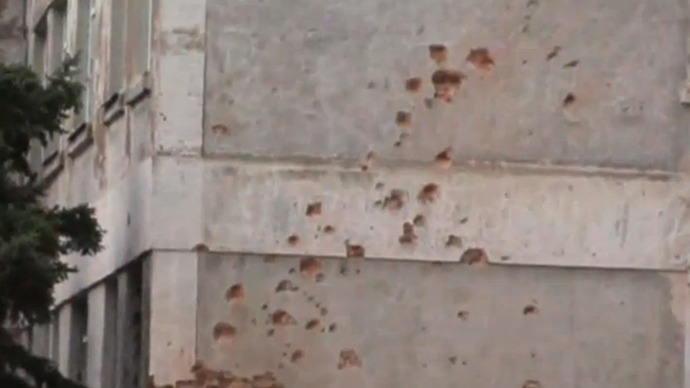 The bandits were given an ultimatum: surrender or be destroyed,” Seleznyov added on Tuesday. A source in the Kiev government told RIA Novosti that president-elect Pyotr Poroshenko had discussed the security operation with US Ambassador in Kiev Jeffrey Payette who called for a “decisive action” by Kiev against eastern regions of Ukraine. After this meeting, the source claimed, Poroshenko demanded security forces hold a “sweep” in Donetsk and Lugansk regions before his inauguration, scheduled for June 7.